Login Login with Facebook account Forgot password? Want to become AIRTH reader and contributor? Beer Fountain Green Gold is an innovative tourism product, first of a kind in the world. The originality of the idea lies in the fact that it connects our hops heritage, which is deeply rooted in the Savinja Valley, with the present time and preserves it for the future. Its uniqueness lies in the fact that the Beer Fountain Green Gold is an innovative concept of beer tasting, hops narrative stories, an attractive architectural object and perfection of technology. Municipality Žalec is the 17st biggest municipality in Slovenia with the city of Žalec as an administrative, economic and political center of Lower Savinja Valley. In the Development Strategy of Žalec Municipality 2014 - 2020 tourism is recognized as an important prosperous industry. We have lots of tourist attractions but till now we were not satisfied with number of tourists visiting Žalec and the visibility of Lower Savinja Valley among tourists. In searching for a solution that would place us on the map of global tourist destinations, it was clear to everyone that we needed something exceptional, unique and connected to our hop and beer heritage. Namely Slovenia is at the 5th place in world’s hop production and the vast majority of hops comes from Lower Savinja Valley. Hops has deeply marked our valley and its habitants: economically, anthropologically and sociologically. In Žalec sites the Slovenian Institute of Hop research and Brewing, one of three in the world. Besides the Institute stands The Eco-Museum of Hop-Growing and Brewing Industry in Slovenia, which transfers our rich heritage of hop plants to future generations. The resident of Žalec was famous Simon Kukec, the father of brewing, after which the municipality named its own brand name of beer. Thus, the idea of a beer fountain, a first-class tourist attraction, which would connect our heritage with the present time and preserve it for the future and attract tourists to Žalec, was created. 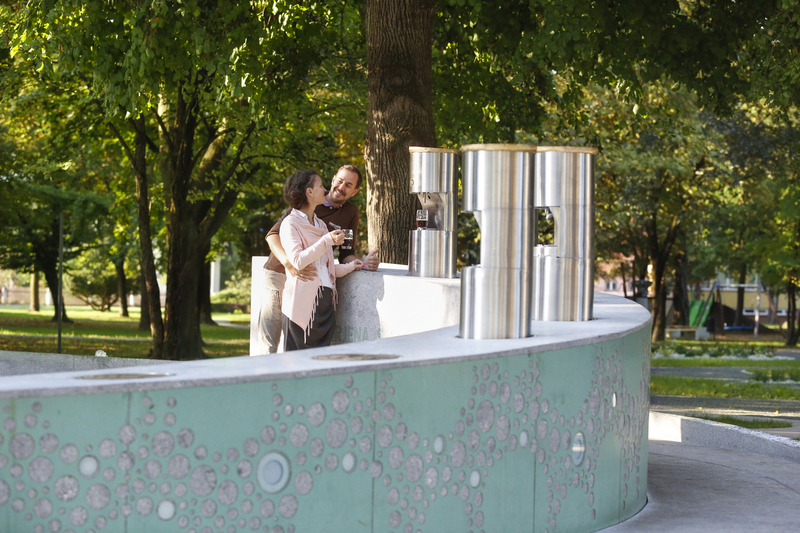 The idea of a beer fountain was so outlandish that some residents of Žalec, representatives of the local community and even some media representatives did not believe in its realization. Development of a new product is associated with risk, especially if it is a product with such a high level of novelty as this. The risk cannot be circumvented, but it can be reduced and we did this by carefully developing the new product according to the marketing theory and practice. We formed a team of experts from various fields. The project team went through numerous difficulties through the time as the idea was being implemented. The biggest promotor of the product realization was the mayor Janko Kos itself. He believed in the realization of beer fountain from the beginning and supported team’s decisions all the time throughout the implementation phase. The construction of the beer fountain with a technical solution was estimated at 350,000 euros. But we didn’t want to finance the entire amount by the municipal budget, because the project was not approved by all public. We turned to entrepreneurs and businessmen of our municipality to help us raising funds. They believed in the idea of a beer fountain and saw it as an opportunity for tourism development and economic growth, so they have donated some funds. Some residents of the municipality, who considered the idea worthwhile to be realized, have also donated certain amounts. At the end, more than half of the funds needed for the project realization was collected through donations. Good motivation for realization of the beer fountain was also the recognition of Slovenian Tourist Board for the idea of beer fountain as an innovative new product in tourism. They awarded us with the prize of Creator (Snovalec) 2016 for “a successful combination of authentic local stories from the past and present, for an innovative way to carry out promotion of Žalec, Savinja Valley of Hops and Slovenia and also for successfully combining the interests of diverse public and private partners in a common project." High visibility in domestic and foreign media (BBC, Daily Mail, Lonely Planet, Food & Wine, New York Post ...) already during the implementation phase has also helped us a lot, especially in building awareness of the fountain by the target audience. The construction work started in April 2016 and in accordance with the timetable the Grand opening of the Beer Fountain Green Gold was on 6th September 2016 on the Municipality day. A fountain is symbolically designed as a Hop umbel, expressed in two semicircles or fountains: beer fountain and water fountain. We have a slogan: “in the embrace of green gold”. Both Fountains symbolically embrace themselves. A visitor buys a special beer mug under which there is a chip with an information that beer can be filled 6 times with an amount of 1 deciliter. The special beer mug is designed by world-renowned designer Oskar Kogoj (he is also our honorary citizen) and can be taken home. All selected beers at the beer fountain are brewed with Slovenian hops. The Beer Fountain Green Gold was succinctly described by the largest publisher of travel guides Lonely Planet as: “The small town of Žalec in eastern Slovenia is planning to put itself on the map by building Europe’s first beer fountain”. Marketing activities with good public relations helped us that during the first season which lasted only 2 months (the Fountain is closed in winter) we have sold 36.136 mugs, and more than 94.000 until October 2017. We have planned to sell about 6.000 mugs in one year, so we have enormously exceeded our expectations. As the mayor of Žalec Janko Kos said: “The number of mugs surpassed our most optimistic forecasts. However, we did not overestimate that the Fountain will become a magnet for other tourist providers, souvenir makers, caterers and tourist workers, will raise local economy and become a flagship of tourism in the Lower Savinja Valley”. The Beer Fountain Green Gold has become the basis of a broad, wide and innovative tourist offer of the Žalec Municipality and a basis for the economic growth and prosperity of its citizens. It has become an inspiration for everybody who is looking for a business opportunity in realizing innovative ideas, confirmed by Slovenian Tourist Board award Sower (Sejalec) 2017, following the previous Creator (Snovalec) 2016 award. With implementing the beer fountain, we have proved that even the most unusual idea can be realized, only if you are brave, pervasive and you trust in your knowledge and intuition. © 2018 AIRTH. All Rights Reserved.